Will international attention on the Beijing Olympics impact the government’s policy on censorship? Some argue that the Olympics create a unique window of opportunity for digital activists while others maintain that Beijing’s grip on information communication is more effective than ever. The recent 2008 study, Access Denied: The Practice and Policy of Global Internet Filtering, states that “China institutes by far the most extensive filtering regime in the world, with blocking occurring at multiple levels of the network and spanning a wide range of topics.” Little surprise then that neither Chinese Google Maps nor Microsoft’s Chinese Virtual Earth include high resolution satellite imagery of China. 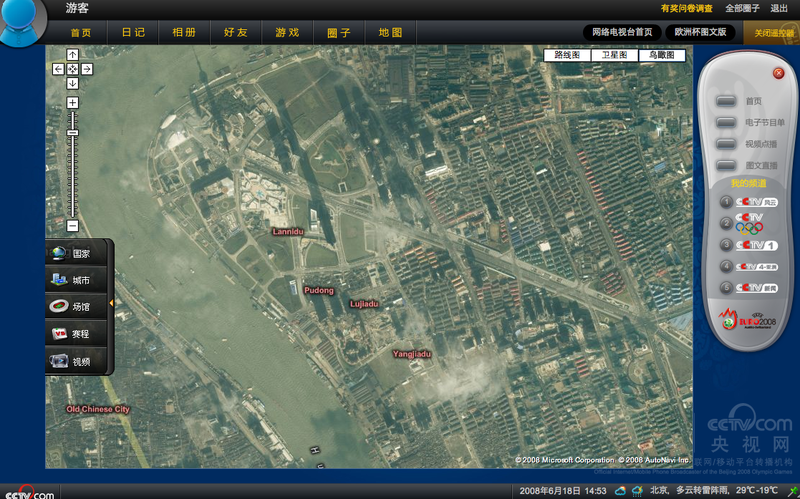 I was therefore amused to learn from Stefan Geens that China’s national broadcasting television (CCTV) is inadvertently providing full access to high-resolution satellite imagery of China via a website that maps the location of football stadiums for Euro 2008. Once you’re zoomed in on an Austrian stadium, there is nothing keeping you from heading on over to China and zooming in on your house or keeping tabs on the People’s Army. In other words, the Chinese state’s own broadcasting organization thinks that the state-mandated censorship of maps is useless and in need of circumventing. This example also illustrates the ease with which such circumventing can be achieved, and the long-term futility of restricting access to mapping tools from behind the Chinese firewall. I’m waiting to hear back from a colleague based in China to find out whether the map is still fully accessible within the country. This entry was posted in Crisis Mapping, Satellite Imagery and tagged Censorship. Bookmark the permalink.